Yu-Gi-Oh! 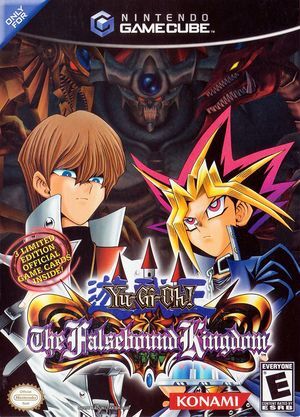 The Falsebound Kingdom is the only Nintendo GameCube game in the Yu-Gi-Oh! series. Yu-Gi-Oh! The Falsebound Kingdom takes a different direction from the rest of the series, being more of a mix of real-time strategy and console role-playing game elements than the typical card battling games seen on other systems. The system it uses is unconventional, but quite effective, as it uses a 3D battle stage including bonuses and improvements (such as fortresses, weapons, etc.) It features most of the major characters from the anime and manga series as well as 177 monsters. On both Dolphin and a real GameCube this title will occasionally crash in the middle of levels, typically after battles. Reloading a save state works, but it will usually keep crashing during that level until you restart the emulator and start the level again. Crashes can be averted entirely by saving and restarting Dolphin in between each level; which can prevent any progress loss. Refer issue 7255. The graph below charts the compatibility with Yu-Gi-Oh! The Falsebound Kingdom since Dolphin's 2.0 release, listing revisions only where a compatibility change occurred. This page was last edited on 1 March 2018, at 06:01.